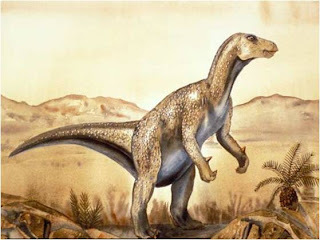 Dinosaur, one of a group of extinct reptiles that lived from about 230 million to about 65 million years ago. 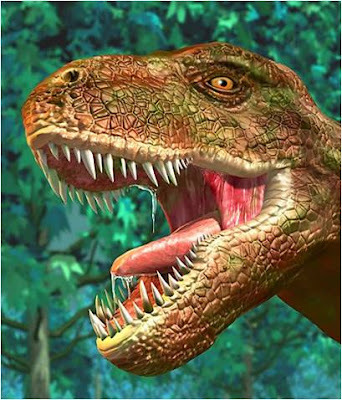 The word dinosaur was coined in 1842 by British anatomist Sir Richard Owen, derived from the Greek words deinos, meaning “marvelous” or “terrible,” and sauros, meaning “lizard.” For more than 140 million years, dinosaurs reigned as the dominant animals on land. Owen distinguished dinosaurs from other prehistoric reptiles by their upright rather than sprawling legs and by the presence of three or more vertebrae supporting the pelvis, or hipbone. Dinosaurs are classified into two orders according to differences in pelvic structure: Saurischia, or lizard-hipped dinosaurs, and Ornithischia, or bird-hipped dinosaurs. Dinosaur bones occur in sediments that were deposited during the Mesozoic Era, the so-called era of middle animals, also known as the age of reptiles. This era is divided into three periods: the Triassic (251 million to 200 million years ago), the Jurassic (200 million to 145 million years ago), and the Cretaceous (145 million to 65 million years ago). Historical references to dinosaur bones may extend as far back as the 5th century bc. Some scholars think that Greek historian Herodotus was referring to fossilized dinosaur skeletons and eggs when he described griffins—legendary beasts that were part eagle and part lion—guarding nests in central Asia. “Dragon bones” mentioned in a 3rd century ad text from China are thought to refer to bones of dinosaurs. The first dinosaurs studied by paleontologists (scientists who study prehistoric life) were Megalosaurus and Iguanodon, whose partial bones were discovered early in the 19th century in England. The shape of their bones indicates that these animals resembled large, land-dwelling reptiles. The teeth of Megalosaurus, which are pointed and have serrated edges, indicate that this animal was a flesh eater, while the flattened, grinding surfaces of Iguanodon teeth indicate that it was a plant eater. Megalosaurus lived during the Jurassic Period, and Iguanodon lived during the early part of the Cretaceous Period. Later in the 19th century, paleontologists collected and studied more complete skeletons of related dinosaurs found in New Jersey. From these finds they learned that Megalosaurus and Iguanodon walked on two legs, not four, as had been thought. In the late 19th and early 20th centuries, as the science of paleontology grew and the search for dinosaur remains was extended around the world, new kinds of dinosaurs were discovered. Hundreds of different varieties of dinosaur have been identified from bones found on all of the continents as well as on the islands of Greenland, Madagascar, and New Zealand. Dinosaurs belong to a group of advanced reptiles called archosaurs, which appeared late in the Permian Period. Archosaurs survive today in the form of crocodiles and birds. In addition to dinosaurs, extinct archosaurs included pterosaurs (flying reptiles) and a number of other types of reptiles formerly grouped together under the name thecodonts. During the Triassic, two distinct groups of archosaurs evolved, one related to crocodiles and the other related to dinosaurs, birds, and pterosaurs. Scientists were once confused about the early ancestors of dinosaurs because some of the archosaurs related to crocodiles developed a number of dinosaur-like features, including walking upright on two hind legs. This phenomenon is known as parallel evolution, in which animals that are not directly related come to resemble each other because they have similar life styles or diets. New fossils have allowed paleontologists to better recognize the true ancestors of dinosaurs. The ancestors of dinosaurs also walked on two hind legs, but had S-shaped necks; simple, hingelike ankle bones; and other distinctive features. Fossil evidence of the earliest dinosaurs dates from about 230 million years ago. This evidence, found in Madagascar in 1999, consists of bones of an animal about the size of a kangaroo. This dinosaur was a type of saurischian and was a member of the plant-eating prosauropods, which were related to ancestors of the giant, long-necked sauropods that included the Apatosaurus. Prior to this discovery, the earliest known dinosaur on record was the Eoraptor, which lived 227 million years ago. 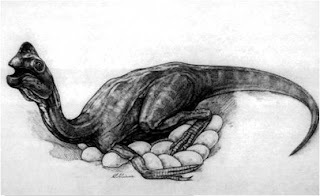 Discovered in Argentina in 1992, the Eoraptor was an early saurischian, 1 m (3 ft) long, with a primitive skull. Scientists have identified remains of a few small dinosaurs representing ornithischians dating from the end of the Triassic Period before about 200 million years ago. By the middle of the Jurassic Period, around 180 million years ago, most of the basic varieties of saurischian and ornithischian dinosaurs had appeared, including some that far surpassed modern elephants in size. Dinosaurs had evolved into the most abundant large animals on land, and the dinosaurian age had begun. Earth’s environment during the dinosaurian era was far different than it is today. The days were several minutes shorter than they are today because the gravitational pull of the sun and the moon have over time had a braking influence on Earth’s rotation. Radiation from the Sun was not as strong as it is today because the Sun has been slowly brightening over time. Other changes in the environment may be linked to the atmosphere. Carbon dioxide, a gas that traps heat from the Sun in Earth’s atmosphere—the so-called greenhouse effect—was several times more abundant in the air during the dinosaurian age. As a result, surface temperatures were warmer and no polar ice caps could form. The pattern of continents and oceans was also very different during the age of dinosaurs. At the beginning of the dinosaurian era, the continents were united into a gigantic supercontinent called Pangaea (all lands), and the oceans formed a vast world ocean called Panthalassa (all seas). About 200 million years ago, movements of Earth’s crust caused the supercontinent to begin slowly separating into northern and southern continental blocks, which broke apart further into the modern continents by the end of the dinosaurian era. As a result of these movements of Earth’s crust (see Plate Tectonics), there was less land in equatorial regions than there is at present. Deserts, possibly produced by the warm, greenhouse atmosphere, were widespread across equatorial land, and the tropics were not as rich an environment for life forms as they are today. Plants and animals may have flourished instead in the temperate zones north and south of the equator. The most obvious differences between dinosaurian and modern environments are the types of life forms present. There were fewer than half as many species of plants and animals on land during the Mesozoic Era than there are today. Bushes and trees appear to have provided the most abundant sources of food for dinosaurs, rather than the rich grasslands that feed most animals today. Although flowering plants appeared during the dinosaurian era, few of them bore nuts or fruit. The animals of the period had slower metabolisms and smaller brains, suggesting that the pace of life was relatively languid and the behavior patterns were simple. The more active animals—such as ants, wasps, birds, and mammals—first made their appearance during the dinosaurian era but were not as abundant as they are now. Did you know you can shorten your long links with OUO and get cash from every click on your shortened links.